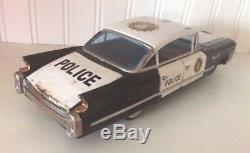 Here is an extremely nice, scarce, battery powered police patrol Japanese tin toy car from 1960, that works. He is black, and white, with a minimal of paint loss, and vibrant litho badging, the interior litho is excellent as well. The trim is plated, and in extremely fine condition, as you can see, the windows are very nice, there is a minimal, chip in the top left crease, there are no lost, or broken pieces. There is very minor color loss on the whitewalls; the hubcaps, and rubber, tires are very nice. The car moves around well, controlled by the battery powered wheels/ tires on the base, look, and see, it works well, as it should, it takes'D' batteries. The on/ off switch works great. This guy measures- 9 3/4'' x 3 1/2'' x 2 3/4'', and makes a great collectible toy you can have fun with. I can not find another car from the same maker, I also can not find a makers mark. I know Japanese toy cars, but I will not assume to know who made this guy. 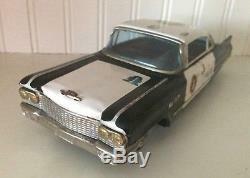 The item "VINTAGE TIN TOY CADILLAC POLICE PATROL CAR JAPAN 1960- BATTERY POWERED- SCARCE" is in sale since Tuesday, January 30, 2018. This item is in the category "Toys & Hobbies\Vintage & Antique Toys\Tin\Vehicles". The seller is "posnansky57" and is located in Milltown, New Jersey. This item can be shipped to United States, Canada, United Kingdom, Denmark, Romania, Slovakia, Bulgaria, Czech republic, Finland, Hungary, Latvia, Lithuania, Malta, Estonia, Australia, Greece, Portugal, Cyprus, Slovenia, Japan, China, Sweden, South Korea, Indonesia, Taiwan, Thailand, Belgium, France, Hong Kong, Ireland, Netherlands, Poland, Spain, Italy, Germany, Austria, Russian federation, Israel, Mexico, New Zealand, Philippines, Singapore, Switzerland, Norway, Saudi arabia, Ukraine, United arab emirates, Qatar, Kuwait, Bahrain, Croatia, Malaysia, Chile, Colombia, Costa rica, Dominican republic, Panama, Trinidad and tobago, Guatemala, El salvador, Honduras, Jamaica.